Well the good news is that yesterday the long awaited 1500 DVDs of Risen! The Musical were delivered to my house. Some will be offered to schools and prisons but a number will be sold at £9.99 with the proceeds going to a charity which provides a safe house for street children in the Philippines, The House of the Heroes www.houseoftheheores.org and www.facebook.com/houseoftheheroes Its Founder is Craig Johnson who is co- director with Ross Gill of Global Fire Creative. It was Global Fire that filmed and edited the Risen! DVD so supporting their charity is a gesture of thanks from mustard seed songs. There will be information next week on how to purchase the Risen! DVDs via our website but if you can’t wait (!!) please email me on ken@risenthemusical.com and I will give you details of how to purchase one at £9.99 plus 0.99p post and packing. 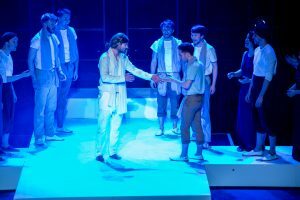 Finishing on a high note – today I am off to the London College of Music in Ealing to watch two performances of West Side Story – why two? Well in the Matinee, Tony is played by Adam Collins (stage name Harry Collins) and in the evening Tony is played by Aaron Peart (stage name Aaron Blackburn) Adam and Aaron both performed in the DVD of Risen! The Musical – Adam playing the disciple Thaddeus and Aaron the disciple Nathaniel. This entry was posted in Ken Shearsmith's Blog on December 15, 2016 by Risen Webmaster.